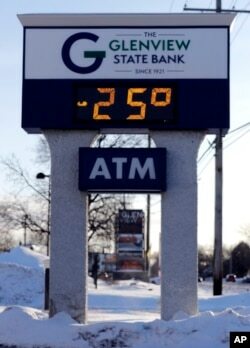 A sign shows the current outdoor temperature in Glenview, Ill., Jan. 30, 2019. 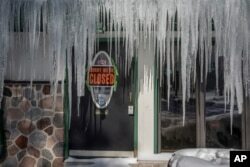 A deadly arctic deep freeze enveloped the Midwest with some record-breaking temperatures on Wednesday. Wind chills reportedly made it feel like minus 50 F (minus 45 C) or worse in several parts of the Midwest. Downtown Chicago streets were largely deserted after most offices told employees to stay home. Trains and buses operated with few passengers; engineers set fires along tracks to keep commuter trains moving. The hardiest commuters ventured out only after covering nearly every square inch of flesh to protect against the extreme chill, which froze ice crystals on eyelashes and eyebrows in minutes. Mail carriers, known for making deliveries through rain, sleet and snow, draw the line at life-threatening cold. The U.S. Postal Service canceled mail service in parts of 11 states Wednesday. A man is bundled up against bitter wind and blowing snow as he operates a snowblower, Jan. 30, 2019, in Buffalo, N.Y. 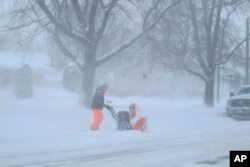 The area received more than a foot of snow since Tuesday and was under a blizzard warning. With nine weather-related deaths reported so far, the cold was spreading east into New England and the mid-Atlantic states. Commuters and schoolchildren could expect to wake up to temperatures in the single or low double digits Fahrenheit in Washington, Baltimore, New York and Boston. This week's cold weather will be just a memory within a few days. Forecasters predicted temperatures in the mid-40s F on Sunday and low 50s F on Monday in Chicago. In Washington, the temperatures are expected to be in the mid- to upper 50s for those two days. Some information for this report from the Associated Press.